When most developers need a venue to host a large-scale tournament they rent it from someone else. Blizzard is not most developers. 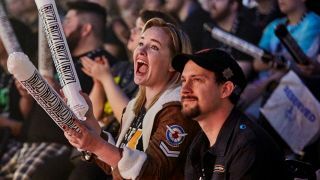 This week, the company behind Overwatch, Diablo 3, World of Warcraft, StarCraft, Hearthstone, and Heroes of the Storm announced a permanent professional broadcast facility in Burbank, California, dedicated to covering the eSports arms of its games. Blizzard Arena Los Angeles will be split into three studio spaces and two production control rooms. The main studio space seats up to 450, while the other two spaces are intended for things like production crew and commentators. There will also be a Blizzard retail store set up to sell merch depending on the competition currently being hosted at the locale. Granted it's not an immense stadium that can hold thousands of screaming fans, but there are perks to having an established base to call your own. "Having an existing space like this, we’ll have fully built-in capabilities where we can basically turn the lights on and tweak some things from event to event," Blizzard told the LA Times. "We’ve definitely learned from all the events we’ve put on over the years." Blizzard Arena opens to the public on October 7 with the Overwatch Contenders Season One Playoffs. After that, it's the Hearthstone Championship Tour, starting October 13, followed by the Heroes of the Storm Global Championship and World of Warcraft Arena Championship in late October.